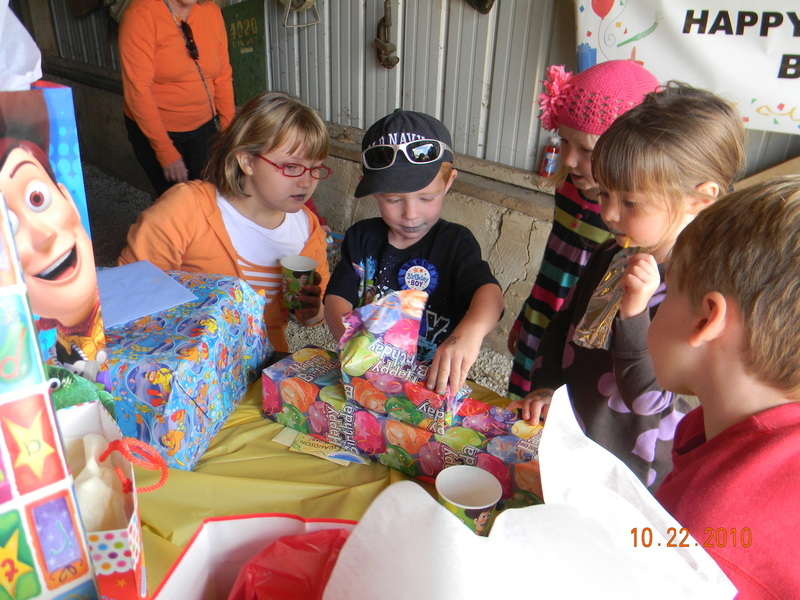 Crawford Farms is the perfect location for birthday parties, family reunions, cub scout or girl scout meetings, church fellowships, military gatherings or class reunions. Our recently renovated barn provides shelter from the sun and elements and houses a collection of old rural items mounted on the walls. Complete with tables, electricity, and access to running water, Crawford Farms provides rustic fun with just enough modern conveniences to meet most peoples needs. With proper adult supervision and a signed waiver, you can even reserve one fire pit with firewood for $35 or a second one for only $15 more to roast your own hot dogs or marshmallows to make s'mores. 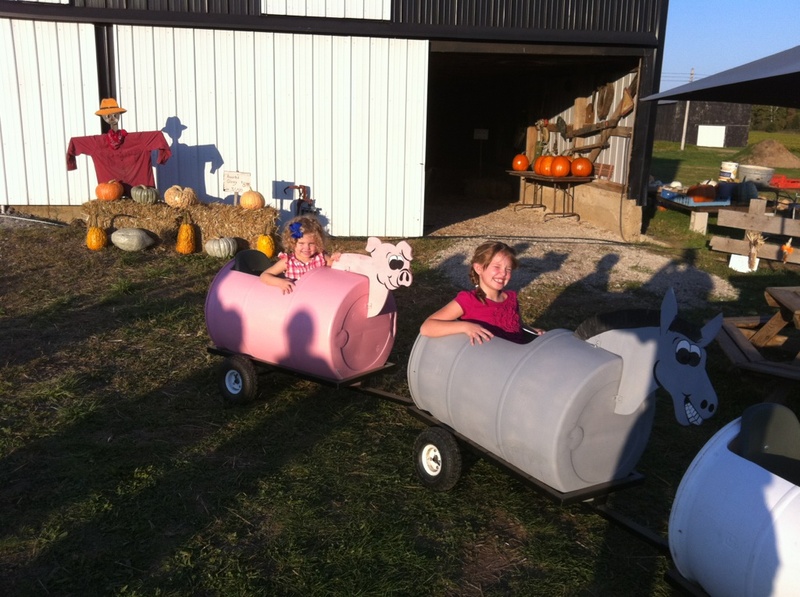 Private hayrides for 34 people (2 per bale) or more if seating 3 per bales can be booked for $50. Barn use includes use of one folding table while others can be brought on site by guests. Larger groups may even book a larger event tent, folding chairs, tables and additional portable restroom facilities. For 2018, we are offering five distinct packages that should meet most groups' needs. All offer substantial discounts off our normal per person rates. Party Packages 1-4 will accommodate groups between 14 - 40 people. These packages can be customized by adding hayrides, fire pits, pumpkins or meal deals. ​The Large Group Package provides even greater per person savings. In order to receive these special party rates, events must be booked in advance. PLEASE CALL MASON AT 270-505-5600 TO SCHEDULE YOUR PARTY OR EVENT. *Additional Party Pack of gourd, barrel train ticket and cup of feed can be added for only $2. ADD A PRIVATE HAYRIDE (34 PEOPLE WITH 2 PER BALE OR MORE WITH THREE PER BALE) TO ANY OF THE PARTY PACKAGES OR LARGE GROUP PACKAGE FOR ONLY $50 OR PURCHASE $2 GENERAL SEATING TICKETS FOR ANY OF OUR GENERAL HAYRIDES. The Large Group package is intended for church groups, boy scouts, girl scouts, class reunions, gatherings of military families, weddings or corporate outings. This package requires a minimum of 50 paid attendees and a minimum $25 rental of one of our party rooms for 2 hours. Groups have the option of adding an additional 2.5 hours of barn rental for just $50 more. Crawford Farms even can coordinate to provide a private tent complete with tables and chairs as well as private portable restroom facilities for an additional fee. The Discounted Admission ticket to Sprigg's Playland and Petting Zoo is required of all in attendance. Sorry but Season Passes do not apply when attending with a group utilizing the Large Group Package Discount. Inquire about adding pumpkins or gourds to your package. ADD A FIRE PIT TO YOUR PARTY OR LARGE GROUP OUTING FOR ONLY $35 OR A SECOND ONE FOR ONLY $15 MORE. FEEL FREE TO CONTACT US TO PLAN ONE OF THE SPECIAL PACKAGES OR TO CREATE YOUR OWN CUSTOMIZED EXPERIENCE.